Galbraith mountain is a world class mountain destination located within riding distance of downtown Bellingham. Over 65 miles of singletrack that winds through 3,000 acres overlooking the city and Bellingham Bay. The mountain is accessible to all non motorized use but all of the trails are built and maintained by the WMBC. Because of the quantity of trails, the mountain can handle 100’s of hikers, runnners, horse riders and bikers during the course of the day without trail users feeling like the trails are busy! To better understand usage on Galbraith, we are about to be implement the TRAFx infared counters at strategic points around the mountain – which will better help the WMBC track numbers of users along with times of usage. There will be two static counters and one that will be moved around during the seasons. The mountain is currently owned by a private landowner so we are guests on the mountain. The WMBC has over 30 years of history stewarding the mountain to keep it open and growing while working with various landowners. Access to the mountain is never guaranteed but current and past landowners have been favorable to working with the WMBC to allow trail Access. There is a great deal of costs involved in keeping the mountain open including insurance and trail maintenance so we ask that if you love riding Galbraith trails to please donate to the WMBC to make sure this mountain never goes away. 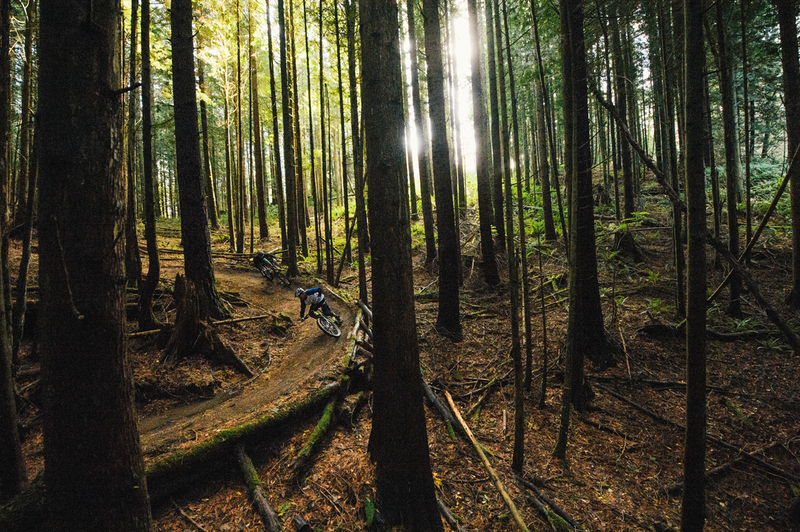 Galbraith has the perfect topography to create a huge network of trails with varying skill levels. The mountain is not too steep and offers the perfect pitch for descents. Trails vary from fast and flowy XC trails to directional jump lines for advanced riders. No matter what skill level you are, Galbraith has a trail that will put a smile on your face. The mountain has two access points, the north and the south entrances. For longer XC loops try the north side entrance and for more jump and freeride lines use the south entrance and head to the top of the mountain. The mountain features trail kiosks at both entrances so you can see where the trails are at but since there are so many trail options we highly recommend buying a Galbraith map to help you navigate. The WMBC has two options for maps of Galbraith. You can purchase a waterproof paper map here: Galbraith Printed Map or you can download our interaction PDF map that works with your phone GPS to show you exactly where you are on the map, purchase the map here: Galbraith PDF Map A portion of the map sales goes directly to the WMBC to help maintain and build new trails on Galbraith. There are two main points to access Galbraith, the northside or the southside. When you go up Galbraith Lane, go straight towards the pipeline road and through the yellow gate. You will access trails like Last Call, New Issues and Lost Giants. Access to the tower road is now via Last Call to Gate and Switch or Last Call to Dog Patch.